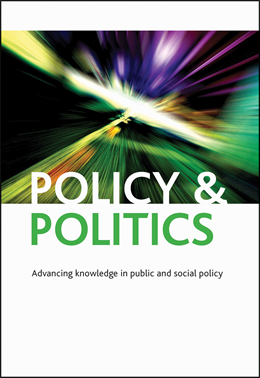 The July issue of Policy & Politics is out now. You can access the full issue here. The latest issue of Policy & Politics is now available for download or in print. This issue has five articles that relate directly to the themes of poverty and social inclusion. Jonathan Greene’s article explores the way that poverty is ‘managed’ through an examination of homelessness in London between 1979 and 1993. Drawing on social movement theory and relating his analysis to collective action, he thinks though these findings for current homeless politics. Alain Noel and Florence Larocque discuss the issue of poverty through a similarly retrospective lens. Their analysis of data between 2001 and 2006 relates to the responses of the EU-15 and the open method of co-ordination. With some caveats, they highlight the ‘enduring power of national institutions’ in this field. Paul Copeland and Mary Daly also concentrate on the EU, and critique its target to reduce poverty and social inclusion in Europe by 20 million. They argue it is ‘ungovernable and ungoverned’ as a result of a mixture of ambiguity, political priority, and the broad scope allowed for interpretation and implementation. Seosamh MacCárthaigh’s review article also looks at poverty but with a more conceptual focus. He connects debates around need and poverty to argue that greater clarity is needed over what the ‘poor’ lack. Stephen Sinclair works through the nuances of the British Credit Union movement. With differences in perspective over the role of credit unions in mind, this analysis points to the limits of achieving social inclusion via credit unions. In articles away from a direct focus on poverty and social inclusion, Stephen Elstub and Lynne Poole raise important questions of democratic governance in their piece analysing state and non-profit sector relationships in the UK. They suggest there is room for an ‘assisted self-reliant complimentarity state–non-profit sector relationship’ to make arrangements more legitimate. Martin Smith and Adam White’s contribution connects the security governance and regulation literatures. They suggest a paradox between market efficiency and a publicly guaranteed social order, and link that paradox to the emergence of a particular politics of security regulation. Ross Fergusson and Nicola Yeats complete the issue of the journal with an examination of the discourses of International Governmental Organisations concerned with youth unemployment. They analyse these discourses according to neo-liberal and social democratic positions and shine a light on a new policy field. We hope you enjoy the new issue – please do give us your feedback in the comment section below.